So, with the end of my blog on Barcelona, I thought I’d update you on what’s next. With some time between proofreading assignments, I’ve been making the most of it for reading and researching new projects. The first news is that I shall hopefully be doing some reviewing for local theatre within the upcoming months. All being well they should appear on the theatre in wales website within the next 3-6 months. I shall keep you updated! Also, I have begun some work, or rather picked up where i left off, on a new piece that I started writing a few years ago. Although it’s been a while, i still feel like there’s scope there to run with and have been getting some material down. Whether it will work out I’m not sure yet. I do feel excited about it though and that’s always a good sign! I also want to get some of my short stories and poetry on amazon in an e book format, and am continuing to look into possible ways to go about that. I think it’s time to go with the e revolution and make the most use of what’s available in this day and age. I feel that it may be a long way off yet, but the ideas are there in the background somewhere, for another time when I have considerably less to do! As for the website, I am still pushing forward on design and content! I really want to make it more interactive and not just about me. I want to hear from other writers and readers about what interests them, and I want to get a wider audience too! I have a few plans in the pipeline for expanding things. Some of which I shan’t mention here just yet. I have some ideas for new pieces for the writers landscapes section, including a piece on Roald Dahl and also Dylan Thomas. And I like the idea of having some kind of ‘quote of the day’ section but i’m yet to figure that one out! The main thing is for me to be a regular contributor on here and to get the feedback and interaction. Ideas on this still need to be set out i think. The most crucial factor for me is time. I wish, like everyone, that I had more of it. It seems only that things are speeding up the older i get! Anyway, just a few thoughts on what the future might hold. Please keep reading and supporting as much as you can, i really appreicate it. This treasure of Barcelona was originally commissioned by Eusebi Guell who wanted to create a stylish park for the Barcelona aristocracy. 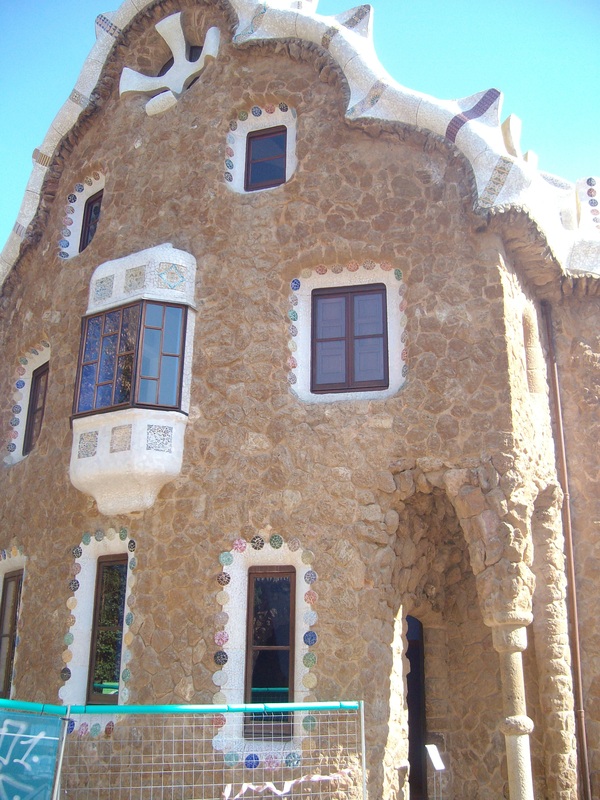 Although it was not sucessful for this use, (it became open to the public in 1922)) with the help of Antonio Gaudi, Guell was able to create a unique and beautiful area made up of colourful sculpture and paths that meander through shrubs and flowers to the natural contours of the land. Set in the lamdscape beneath the mountains, it is a beautiful reminder of Gaudi’s distinctive style. After a steep climb up the hill, we suddenly came upon the entrance to the park, which was signalled by two, striking buildings. Funny shaped and decorated with mosaics and cheerful colours, they looked so surreal that they reminded me of fairytale gingerbread houses. The detail of the design on the buildings is incredible and you could study it for hours. The two buildings seemed quite similar but up close were both very different in design.One of these buildings was a shop, selling Gaudi themed souveniers such as mosaic mugs and dishes, keyrings and postcards. As we walked further into the park we came across Gaudi’s famous dragon fountain sculpture. 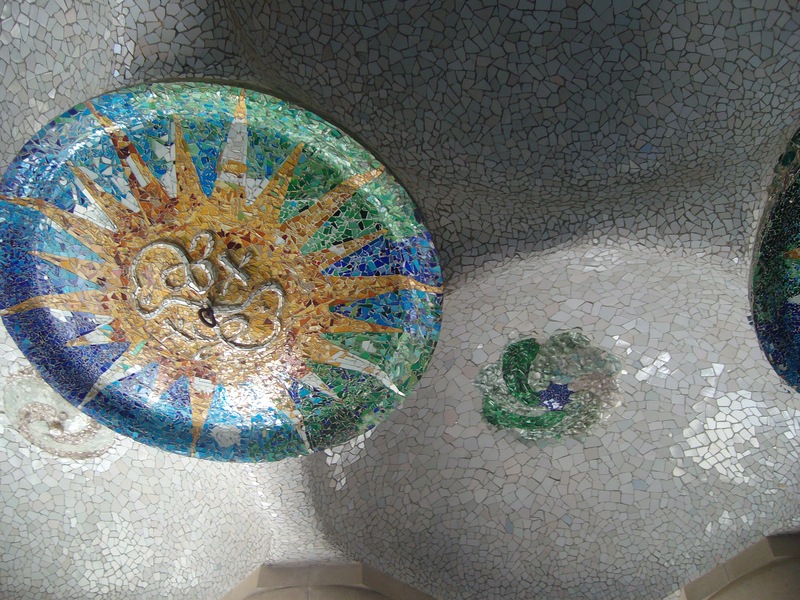 Another example of his use of vibrant colour and mosaics, the sculpture has become a recognisable symbol of Gaudi’s work aswell as Barcelona itself and is frequently featured in souveneirs. The area was so crowded with tourists that unfortunately I was not able to get a photo. 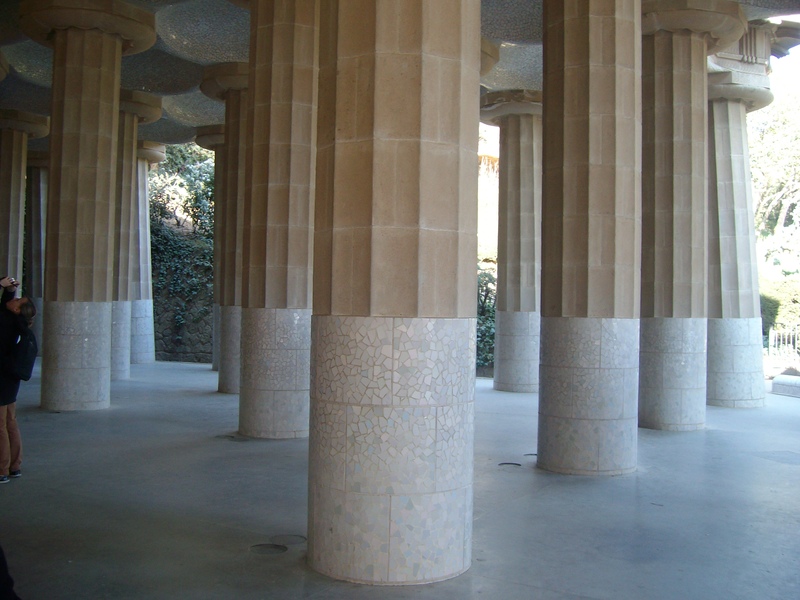 Gaudi’s use of mosaic’s was further evident in the undercover area of the park. 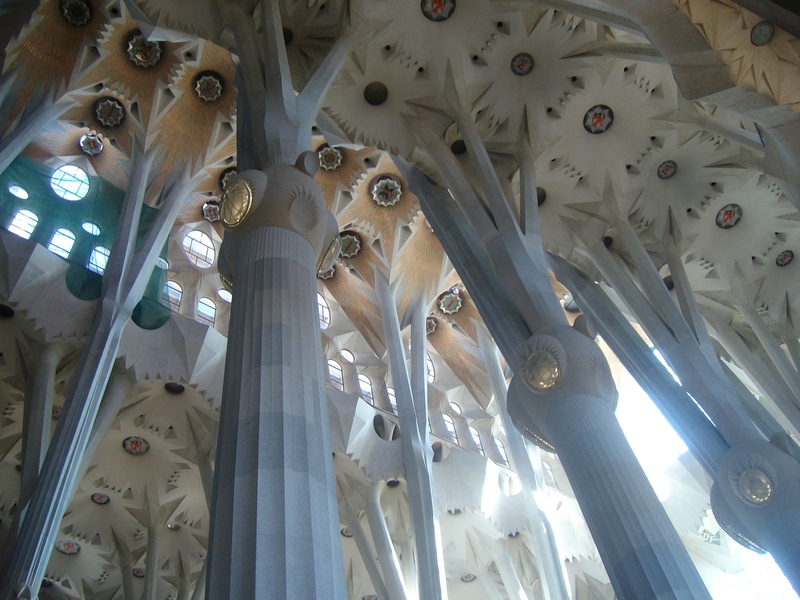 This is some of the detail used on the ceilings of this area, similar to that of other Gaudi bulidings such as Sagrada Familia. The colour and patterns are quite breathtaking and unique once again of Gaudi’s style. The pillars in this area looked smooth, like marble and provided a cool break from the sunshine. A musician was playing here, adding to the relaxing atmoshphere. Just to one side of this area was the Gaudi museum, a small building where Gaudi once lived. Bright and colourful it stands out against the natural landscape and is quite modern in design. The museum still holds objects and furniture designed by the architect. 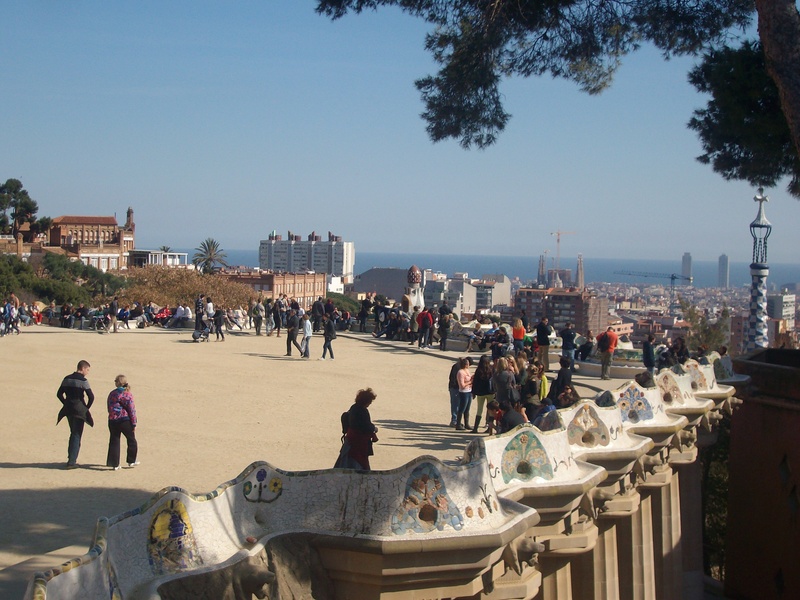 At the top of the park is the terraced area, a vast open space with stunning views over Barcelona. If you look, you can see the mosaic seating areas around the edge of the tearrace. The detail in these is quite incredible, each one being so different to the next. 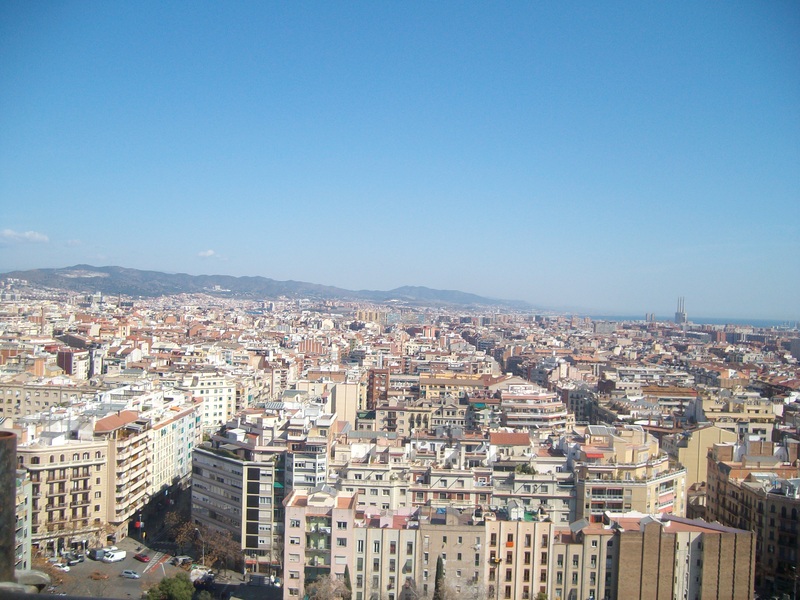 From here we could look out over Barcelona and enjoy the warm breeze away from the hustle and bustle of the city. As we began walking on the pathways leading through the natural landscape, I felt it was quite easy to get lost in the surroundings. The park supports a lot of natural wildlife and I noticed throughout Barcelona, the apprearance of a brightly coloured bird, much like a parrot. 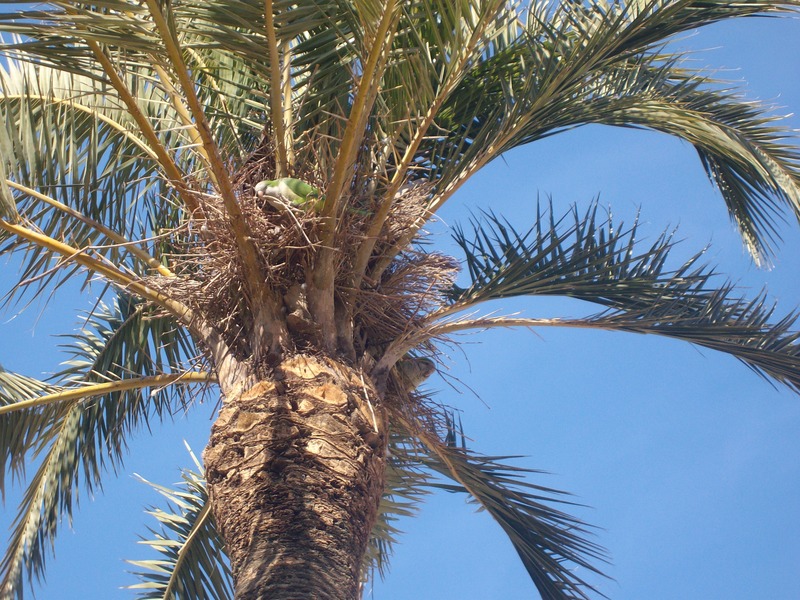 I later discovered that these birds are not native to Barcelona and have escaped from the many open air pet shops that line the streets and begun nesting in the area. They seemed quite content in the area and had probably come to the park for the same reason the public had. To get away from the noise and congestion of the city. 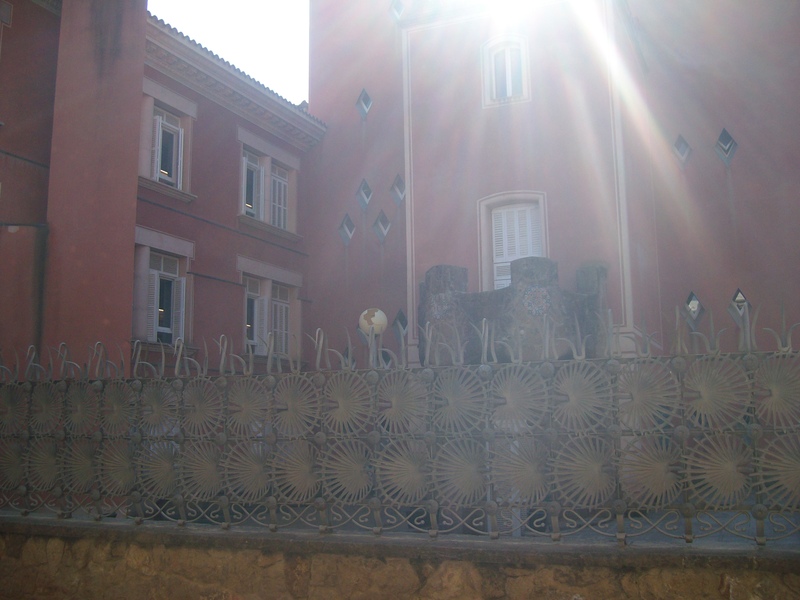 For me, Park Guell was one of the most beautiful of Gaudi’s creations and places in Barcelona. This was the part of our trip that I was most excited about. Speaking to people who had been to Barcelona, all they would talk about was the wonderful architecture designed by a man called Antonio Gaudi. 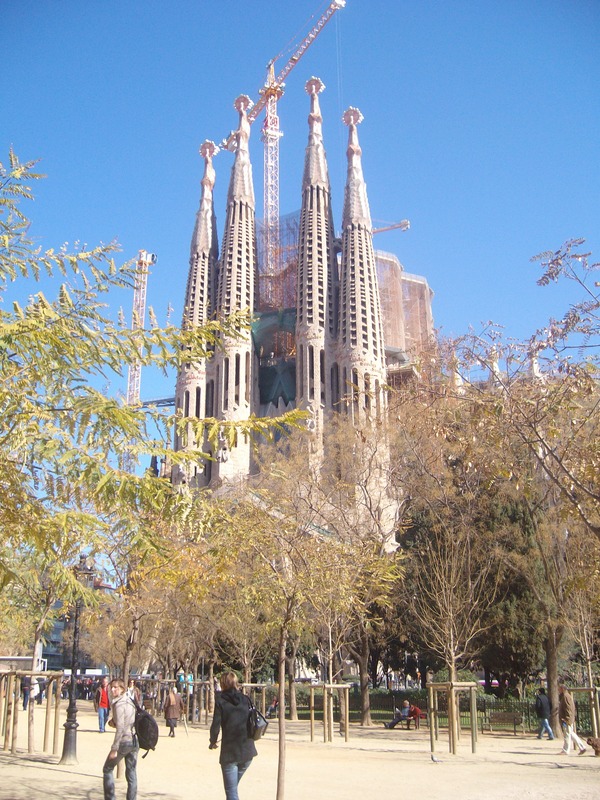 The guide books also noted that a trip to the city was wasted without a visit to Sagrada Familia, Gaudi’s unfinished masterpiece. So this was where we started. 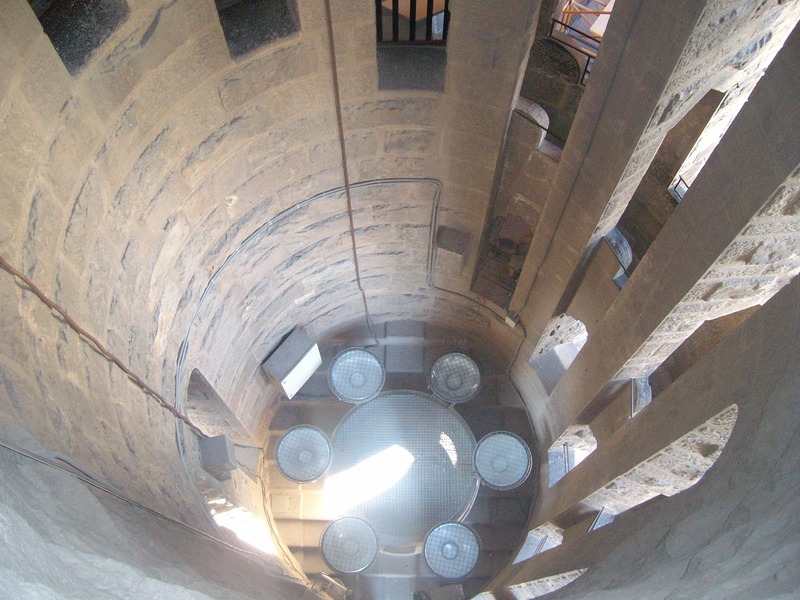 Sagrada Familia was Gaudi’s final and most ambitious project. 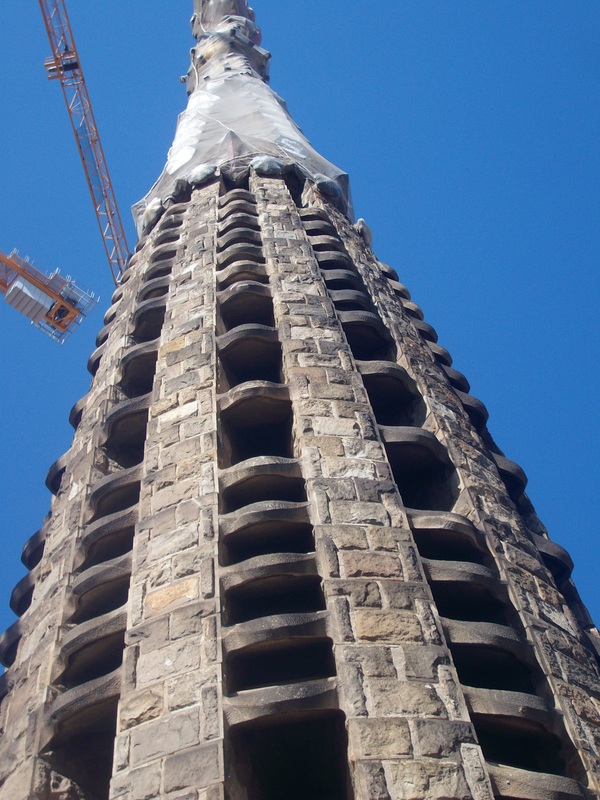 Work began on the church in the late nineteenth century and tragically Gaudi was run over by a tram in Barcelona city in 1926, his dream being unrealised. Since then, building work has continued on the project, working close to the design sketches left behind by the architect. Sagrada Familia has been classed as a third world heritage site and money from the entry goes towards the ongoing project. I had read little of Gaudi and his architecture before going to Barcelona and much of what I knew was by what other people had told me. I had never considered myself to be particularly interested in art or architecture, but nothing prepared me for the sight of the Sagrada Familia. The only way to describe it would be to say that it seems almost unreal. It quite literally takes your breath away. Even from a distance the immense detail and skill of the design is evident. As you walk closer to it you realise the detail in the stonework is incredible. Everywhere you look there is detail, even when you think you have taken it all in, there will be something to further surprise and astound you. At the entrance to the church there are carvings of religious figures and names and inscriptions from the bible. 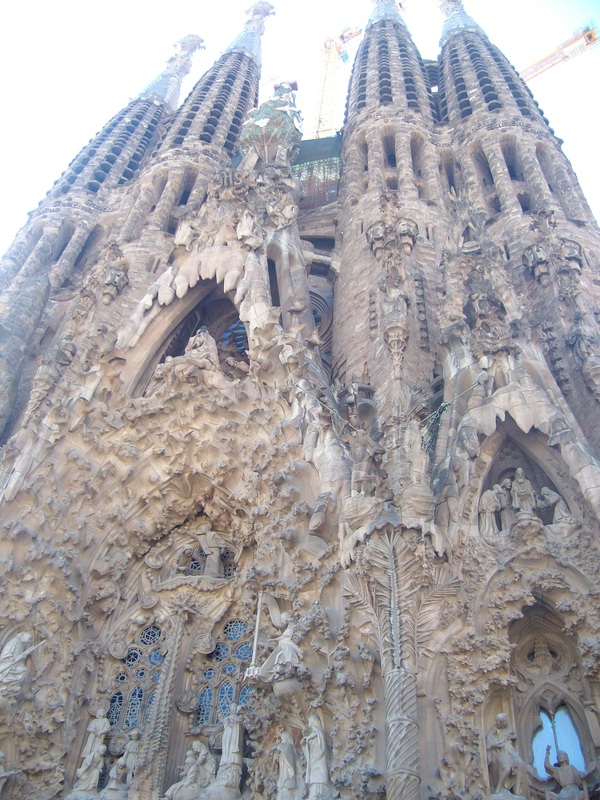 Gaudi was a man of faith and wanted his design of the church to honour this. Inside the detail is even more remarkable, with stain glass windows, more stone work and pillars stretching up to ceilings of incredible beauty. The design on the ceiling reminds me of a world under the sea complete with treasured jewels. 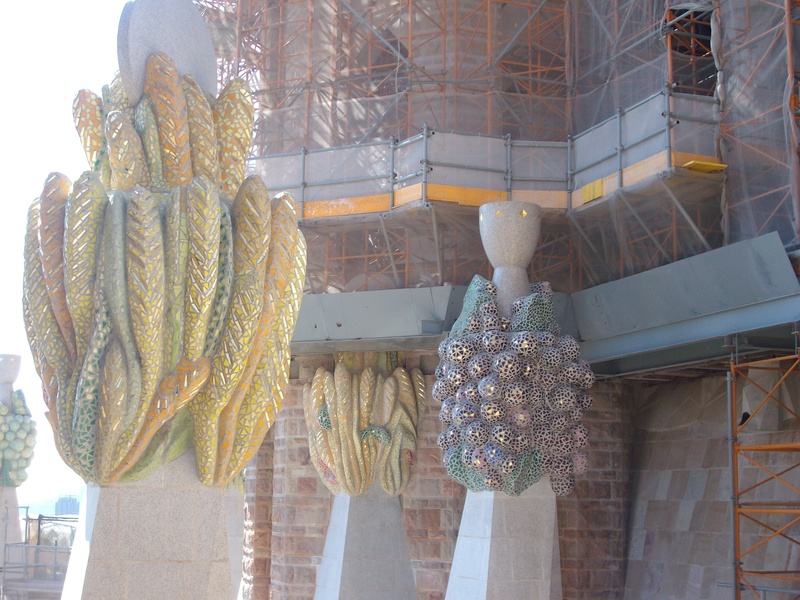 I began to learn that this incredible detail was a symbol of Gaudi’s unique modernist style. As we wandered through the cool and open space, I gazed in wonder, not quite able to believe what I was seeing, but very thankful that I was able to experience it. The Sagrada Familia is a very popular attraction, having millions of visitors every year from students and architects to holiday makers and Gaudi fans. There is a lift inside the church which allows you to go up to the towers. You can then walk between the towers and enjoy fantastic views of the city. This is one of the towers that we walked between. You can see here just how high up we are and how much further the tower stretches above us. The rooftop of the church is not spared Gaudi’s imagination. Smaller spires stick out between these towers and are adorned with colourful decorations like birds and fruit. The views from the rooftop were the best I’d seen and from here we could see the Agbar tower which was next to our hotel the silken Diagonal. The lift at Sagrada Familia only goes one way so we then had to walk down the very long spiral stair cases. The architectural detail was not missing here either, as the staircases seemed to curve round in the shape of a snail and I couldn’t resist taking a photograph down the centre of the staircase. I was a bit spooked when someone was doing the same thing from below! Outside, we took a walk in the area surrounding the church. I was not surprised at this point to discover that the back of the temple contained further detail in the form of religious carvings on the stone work. It is still incredible to look at this photo and think how much work this must have taken to carve so much detail into the stonework. Gaudi was clearly a very insightful, intelligent and driven man. It’s sad to think that he never got to see his vision truly realised. But then it’s also admirable that work is still continuing in a hope of one day completing this remarkable treasure.